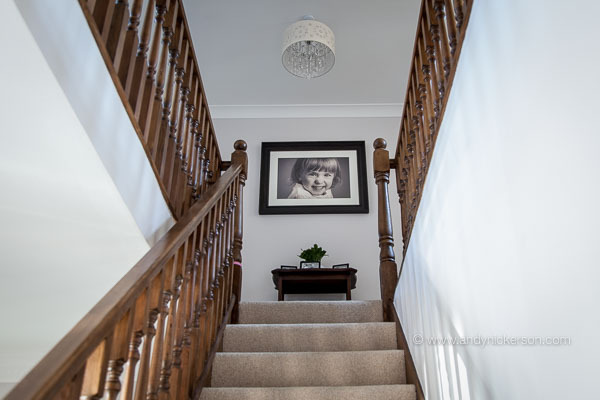 First off we need to offer a heartfelt thank you to our lovely client who kindly allowed me into her gorgeous family home to photograph the bespoke artwork that we’ve recently created for her. Although I’m relatively well house trained (Debbie may well disagree) I do fully appreciate what a privilege it is to be invited into someones home, their personal space. Out of respect for our clients privacy we won’t name any names or exact locations but equally we needed her to know how grateful we are. Please note that all the wall art seen on our website was photographed and turned into timeless, handcrafted artwork by ourselves and our team of trusted local craftsmen. All our wall art comes fully finished and ready to hang. Often when a client commissions us, they’re simply looking for a photographer. A professional photographer to capture a few lovely up to date portraits of their family. Maybe they’ve just welcomed the arrival of a new baby to the family or maybe they simply feel it’s time to enjoy something a little more accomplished than an iPhone snapshot, the reasons will of course vary. Few clients will actually give very much thought as to the final outcome, what they might actually wish to achieve with those lovely portraits. The sad truth is that too many gorgeous portraits will remain largely unseen, hidden away on hard drives or iclouds and rarely be enjoyed… we’d like to try and change this. We want to inspire our clients, help them realise the full potential of their investment in family portraiture. 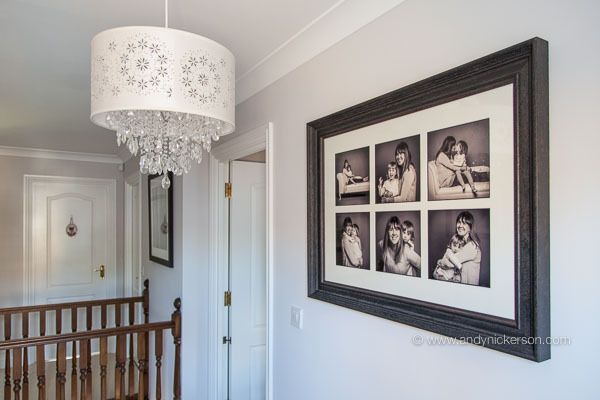 By featuring actual client artwork in the context of their everyday family home, we’ll demonstrate how a beautifully presented and carefully designed portrait can both compliment an existing interior or even transform a newly decorated living space. 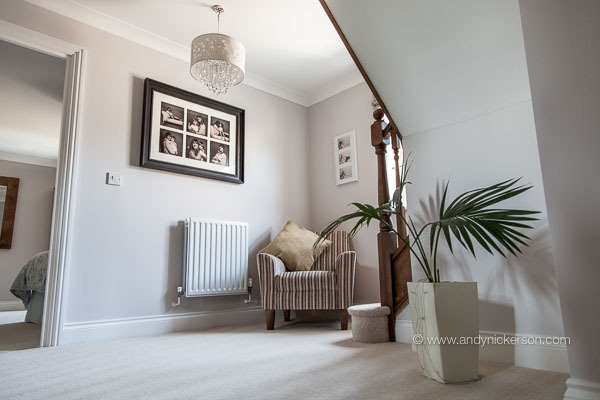 We start off with a magnificent feature portrait positioned dramatically on the clients landing. The minute you walk in through the front door it catches your attention and makes you smile. If you have the space and you’re brave enough, a good sized single portrait can really pack a punch. Although impossible to see from these photos the level of detail in these large portraits is simply awesome, you can see each strand of hair, each freckle and even me reflected in her eye! 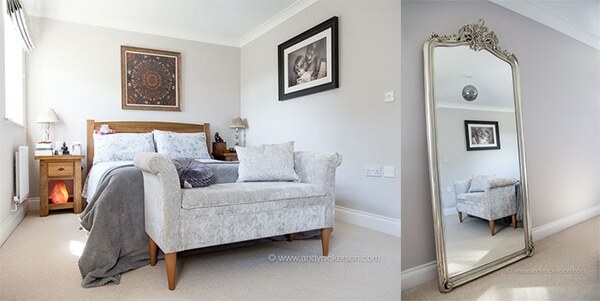 As we move into our clients beautifully designed and decorated bedroom (doing my best Keith Lemon “Through the key hole” impression), you can see this time how a good sized single portrait can feature in a room without over-dominating the space. Where there is more than one person in the portrait, such as this example, we would always recommend a decent sized portrait, helping with both impact and proportion. The last two pieces featured on our clients landing highlight one of our most popular designs, the super flexible and infinitely customisable multi-aperture. Our clients love this style of artwork mainly because it offers up the opportunity to have a bit of fun. 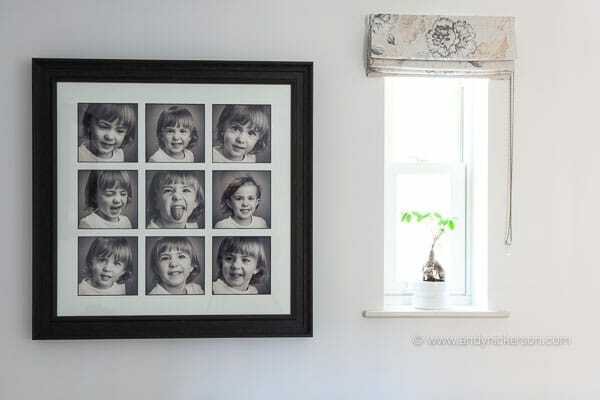 As a specialist children’s photographer I’ve built my reputation on capturing real childhood character and expression so the multi-ap is the perfect piece to really showcase your families vibrant personalities. The custom artwork shown here includes both a 6 aperture and our signature 9 aperture piece.